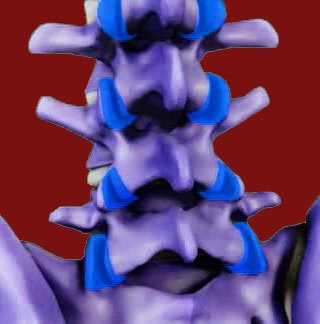 Facet hypertrophy describes abnormal growth of the spinal facet joints due to trauma, arthritis or scarring. There are 2 distinct forms of facet joint hypertrophy that are usually presented clinically: inflammation of soft tissues in and around the joint and overall enlargement of the joint due to the accumulation of osteophyte material. In some patients, both types of hypertrophy will be present in unison, while in others only one or the other variety will exist alone. This investigative essay seeks to define and explain the 2 main expressions of facet joint hypertrophic conditions. We will examine why hypertrophy occurs and the symptoms it may enact in the spinal anatomy. If you have been diagnosed with one or more hypertrophic zygapophyseal structures, then this article is custom tailored just for you. Hypertrophy is a word that always means abnormal growth and enlargement of an anatomical tissue. The nomenclature can be used to describe atypical enlargement of parts of a specific facet joint or the entire joint structure. There is some controversy that joint hypertrophy is actually normal in most people, but the extent visualized in order to diagnose the condition is beyond the typically demonstrated range. Hypertrophy is not inherently synonymous with inflammation, although swelling can contribute to hypertrophic facet conditions. True inflammation can be expressed in the facet joint by the ligaments surrounding the joint capsule, called ligamentous hypertrophy, or by irritation of the cartilage that is designed to protect the bony surfaces of the facet joint as degeneration occurs. When the cartilage breaks down as part of the degenerative process, it sometimes becomes painful and inflamed. Bony hypertrophy is the usual use of the word in relation to facet joints. In this scenario, the entire skeletal joint grows in size due to the presence of various bone spurs that add mass to the structure. As the size of the facet grows, its functionality is often decreased due to mechanical difficulties. The joint might also begin to encroach on the neuroforaminal openings, potentially creating a compressive neuropathy of the nerve root at the affected vertebral level. Hypertrophy is normal to some degree. The zygapophyseal structures tend to get larger as age and activity encourage the osteoarthritic processes to deposit spurs and debris in and around the joints. Likewise, some degree of inflammation is expected as the joint dehydrates and the cartilage deteriorates. The main driver of the hypertrophic process is osteoarthritis. Contributing factors include ligamentous degeneration, intervertebral disc desiccation, spinal injury, surgical injury, genetic predisposition and other spinal irregularities that influence the functionality of the facet joints. Most people will develop minor age and activity-related changes in the apophyseal joints as they get older, including mild hypertrophy. Most of these conditions will not generate pain to any substantial degree. However, known or idiopathic circumstances can cause some people to develop terribly painful hypertrophic facet structures that might require ongoing care or even invasive surgical treatment. These cases represent the gross exceptions to the rule of asymptomatic facet joint aging. Facet hypertrophy might be suspected based on patient complaint, expressed symptoms and clinical examination. However, it can only be confirmed by utilizing advanced medical imaging to view the joint directly and ascertain the degree of enlargement present. Minor hypertrophic conditions are rarely painful and even some extreme bone-related hypertrophy can be completely asymptomatic. Other hypertrophy problems are dire and might even require very invasive spinal surgery. There is no absolute when it comes to the pathological potential of hypertrophic conditions and all should be evaluated by a specialist in facet joint pain syndromes. To learn more about the underlying changes in the body that contribute to mechanical back or neck pain, please continue forward to read our report exploring facet syndrome.